Yamaha Launches Big Scooter Model Featuring CF Aluminum Die-cast Frame, DiASil Cylinder and FI System - Incorporating core technologies helps promote the NEXT 50 medium-term management plan - - News Releases | Yamaha Motor Co., Ltd.
Yamaha Motor is adopting all-new parts and components for the Grand Majesty YP250G, a big scooter scheduled to go on sale in Japan on March 3, 2004. For the first time in a scooter of this size, the body of the Grand Majesty will feature a CF (Controlled Filling) aluminum die-cast frame. In addition, the new model incorporates a DiASil (Die-casting Aluminum-Silicon) cylinder for the engine, and an electronically controlled FI (Fuel Injection) system. Yamaha Motor has been aggressively promoting a growth strategy, one of the key priorities spelled out in its medium-term management plan, NEXT 50. In the effort, the Company has been pursuing technological development designed to hone its competitive edge in existing businesses while building the foundation for future growth in its new businesses. Particularly in the mainstay motorcycle business, the Company remains firmly committed to its quest for greater riding performance, adherence to Yamaha design concepts and environmental consciousness. These objectives come together in the Company's business landmark: becoming and remaining "Number 1 in exciting performance and stylish design." To attain its goal, the Company is focusing on the creation of new aluminum materials technology, while also emphasizing the development of FI, component and electric-motor technologies. 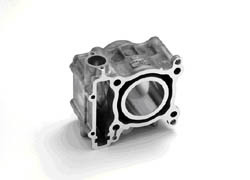 (1) The Company is utilizing its original DiASil (all-aluminum, non-plated and sleeveless) cylinder for the first time. It boasts 60% better cooling performance than its conventional, cast steel liner-type counterpart - in a compact, 30% lighter design. In addition, the DiASil cylinder offers outstanding recyclability. (2) The Grand Majesty YP250G is also the first 250cc scooter to feature the CF aluminum die-cast frame, which the Company has previously incorporated in its main European models, the YZF-R6 and FZ6. 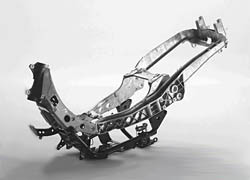 Since it is now possible to produce larger, thinner aluminum parts, the number of parts on the frame has been reduced by about one third compared with conventional models. In turn, the proportion of aluminum incorporated in the new model has risen 10 percentage points above conventional models, to 30%. (3) The new model incorporates the FI system featuring a suction piston - which has won acclaim in existing models, including the YZF-R1 and -R6 - to achieve outstanding air intake efficiency and response. With these improvements, the FI system provides excellent reliability. Yamaha Motor has been aggressively expanding CF aluminum die-cast technology applications, from the body frame and DiASil cylinder of motorcycles, to ATVs (all-terrain vehicles) and snowmobiles. The Company now plans to incorporate this innovative technology into a wider range of products, including outboard motors. In addition, Yamaha Motor is accelerating the development of eco-conscious aluminum materials technology that offers superior recyclability with less environmental impact for next-generation production. The Company also aims to gradually expand the application of its optimized FI system for small motorcycles, ultimately seeking to mount FI systems on all motorcycles - larger models as well as small bikes - by 2007.